This entry was posted on Friday, August 5th, 2016 at 2:47 pm. 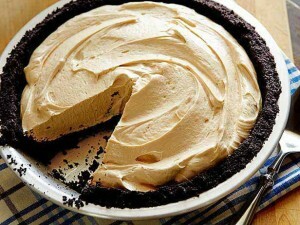 My brother-in-law made this pie for the family a few holidays ago, and it was an instant hit! I made it recently for a party, and no one could tell it was gluten free! Preheat oven to 350°F. In bowl or food processor, grind cookies (including filling) until very fine. Crumbs should hold together when pressed or squeezed. Press cookie crumbs evenly into the bottom and side of a 9-inch pie pan. Bake until fragrant and firm, about ten minutes. Remove crust from oven. Place on a rack to cool. You are done with the oven. Prepare the filling. In a large bowl (I used my KitchenAid mixer), whip together peanut butter and cream cheese until smooth. Add powdered sugar. Whip until combined. Mixture will be thick. Add Cool Whip. Turn mixer on to medium-high, and whip until smooth. Spread filling into prepared crust (after crust has cooled completely). Chill for two hours or overnight. You can add more Cool Whip, whipped cream, or a chocolate drizzle on top! Serves 8 – 12 people.